This is more content from Barney Oldfield's personal scrapbook, and, like the rest the names of the newspapers that originally published the material were snipped off the clipping. There are two articles and both are very brief. Nonetheless they provide color and insights. The one I like the most discusses the fact that Oldfield broke the paradigm of the day in selecting a car for the 1914 Los Angeles to Phoenix "Cactus Derby" off road race, which he won. 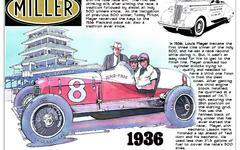 His car was the same Indianapolis 500 racer he used in finishing fifth at the Speedway earlier that year. The other article discusses the ride of the race's top three finishers (Oldfield, Louis Nikrent and T.J. Beaudet) trip back to Los Angeles from Phoenix aboard the "Howdy Special." Great color, it puts you in the moment and I love that.